The Walt Disney Autograph Expert! If you have disabled pop-ups, cart may not display. Prefer to use the manual order form? Click here. 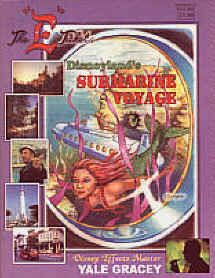 "...Only a few (dealers) specialize in authentic, vintage Disney autographs and memorabilia. 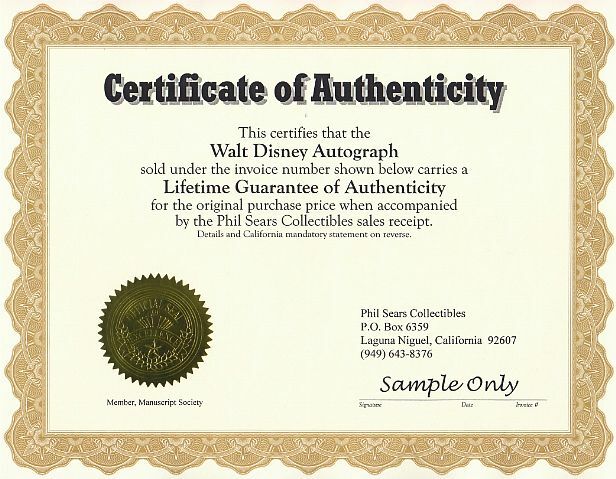 Perhaps the best of these is Phil Sears..."
with TWO Certificates of Authenticity! 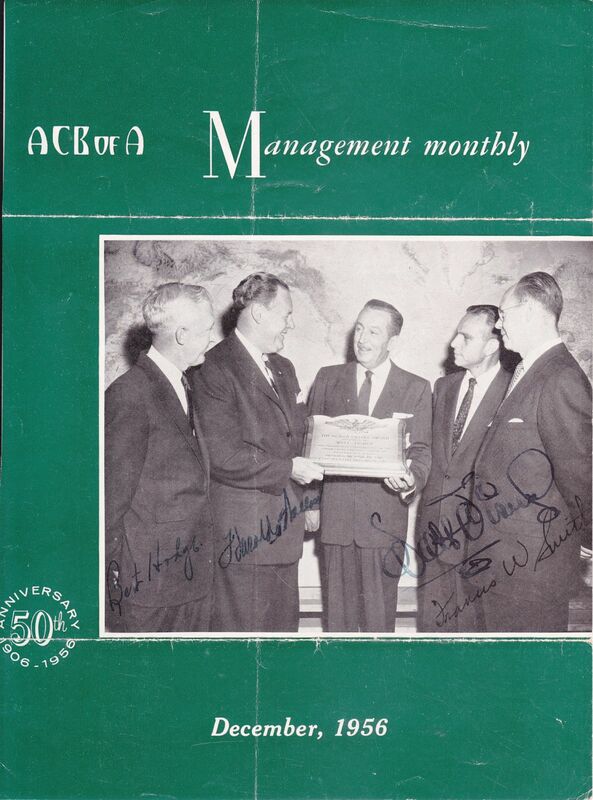 Walt Disney has personally autographed this magazine cover photo of him receiving an award. Dated 1956, the year after Disneyland opened, this is the cover of a publication called the "ACB of A Management Monthly" (possibly the newsletter of the Associated Credit Bureaus of America). 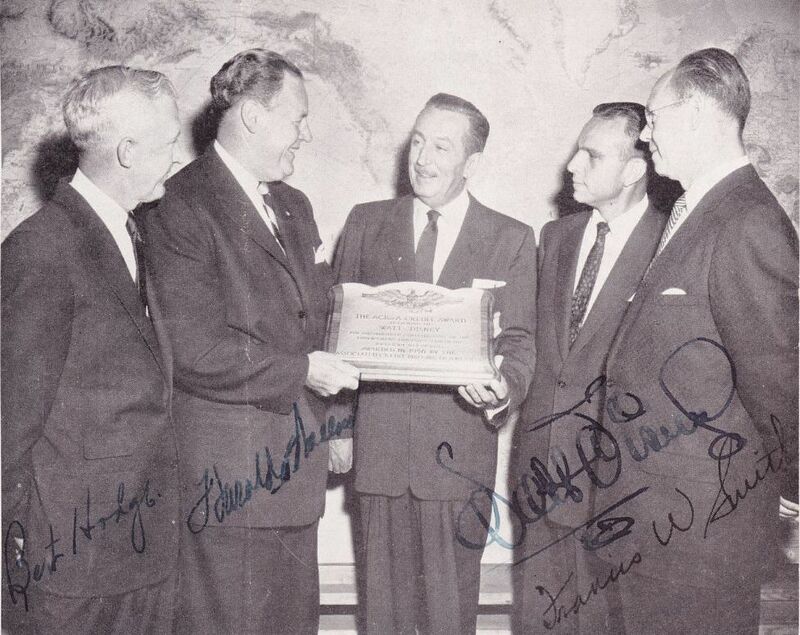 Walt is shown with other businessmen who have also autographed the photo. *Do not use the "Add To Cart" button if you wish to pay using our 10 month layaway payment plan. Instead CLICK HERE for the layaway order form. Most orders totaling $149 or more can be placed on layaway. Layaway does not require credit and is not the same as PayPal Credit. U.S. shipping charge on this item $12.95. Foreign shipping $39.95. Automatic checkout will not calculate foreign shipping accurately. After you place your order we will email foreign customers for additional shipping payment. Includes my Lifetime Guarantee of Authenticity! 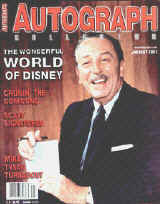 Article About Walt Disney's Autograph! Phil Sears Collectibles Come From??? -And we'd like to buy from you if you have something amazing! SALE OF AUTOGRAPHED COLLECTIBLES: AS REQUIRED BY LAW, A DEALER WHO SELLS TO A CONSUMER ANY COLLECTIBLE DESCRIBED AS BEING AUTOGRAPHED MUST PROVIDE A WRITTEN EXPRESS WARRANTY AT THE TIME OF SALE AND A THREE-DAY RIGHT OF RETURN. THIS DEALER MAY BE SURETY BONDED OR OTHERWISE INSURED TO ENSURE THE AUTHENTICITY OF ANY COLLECTIBLE SOLD BY THIS DEALER.